Today I am finally ready to share a little project that I’ve been working on for the past couple of weeks. Introducing: Instagram Leaders. According to my ongoing research of over 1 million hotel websites from all around the world, Instagram is used by ~9.81% of hotels. After a couple of weeks of tinkering with code, I finally came up with a good way to gather, sort, filter and rank the stats from all these Hotel Instagram accounts. Influencer Marketing has grown a lot in the past 2-3 years, so the Instagram Leaders project can help influencers find potential partners much easier. I would assume that a hotel that is very popular on Instagram is more likely to consider a collaboration with an Instagram influencer. 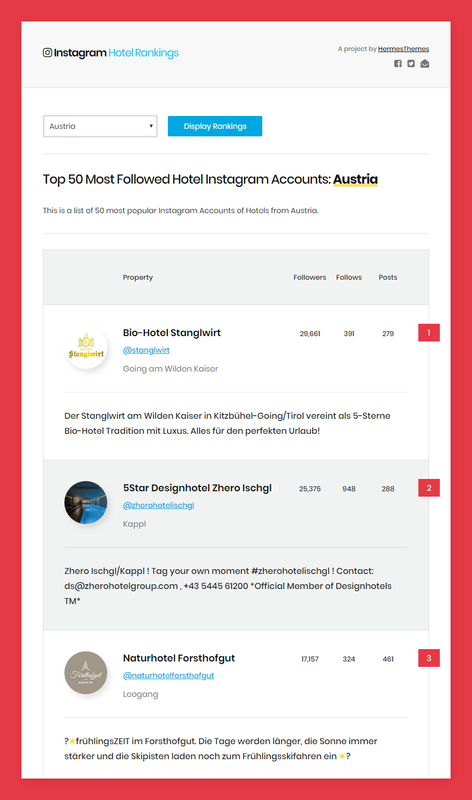 Let’s look at an example: Top 50 Most Followed Hotel Instagram Accounts from Austria. When having to choose from a selection of hotels with similar amenities and room rates, I see a world in which someone would choose a hotel that is more popular on Instagram over one that isn’t. I would love to hear what other people think about these Instagram rankings. Do you see other scenarios in which this information would be useful?